The decades-old Honacha eatery is usually bursting at the seams during lunchtime, with a press of people crammed into the cozy two-storey space. As one leaves behind the traffic of the bordering Mamaru galli and enters the narrow passageway that leads into the smoky, rundown restaurant complex, the matriarch of the kitchen, usually armed with a spatula in one hand, acknowledges you with a simple nod. Surrounded by an array of kitchen equipment and condiments – a gigantic iron skillet, a bowl of battered mung beans, crates of eggs, a deep dish of spicy potato curry and buffalo meat in various stages of preparation – she commands her space. I place an order with a passing waiter, for a regular buff bara with a plate of choila and spicy potatoes, and amble around the front space, observing the mechanics of bara preparation, the specialty at the Honacha kitchen. The cook dips her ladle into the mung-maas lentil batter, gives it a deep swirl and pours the thick cream onto a patty of buffalo meat cooking slowly on the hot skillet. An egg is broken neatly on top and a rich spicy aroma quickly diffuses all over the kitchen and dining space. The liquid drizzle of mung, maas and minced meat slowly dries, soaking in all the existing flavors from the skillet. The buzz of conversation from all around is generally loud, but I find the sound, and smell, of cooking to be equally overpowering. When my order is ready, I walk upwards to the roof, to take my place in a corner and eat my serving of bara, choila and spicy potato. The egg is runny and drips off the corner of my bara as I take a bite, inhaling the smoky succulent flavors of minced meat and ground mung beans. The afternoon is warm and breezy and I look out at the intricate edifice of the Krishna Mandir that stands right in front of me, and observe the people sitting under its eaves. I smile at a couple sitting on one side of a ledge and an uncomfortable old man on the other. I look downstairs towards the entrance, to more people huddling in, to soak in the flavors of this Newar eatery. 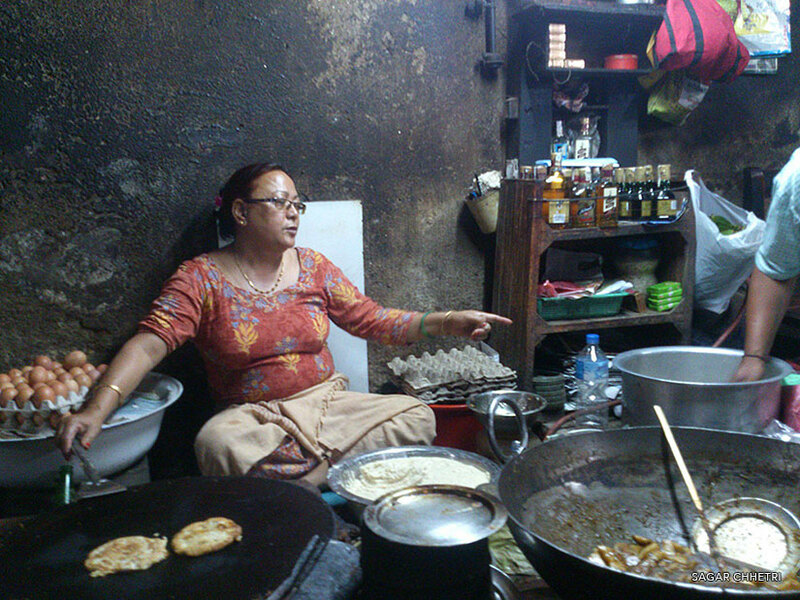 Honacha, a decades-old Newari kitchen, is a landmark in Patan. Located just behind the iconic Krishna Mandir in the Patan Durbar Square, it is a small restaurant that serves traditional Newari fare. The food is impeccable and a true taste of Patan. But be warned, it is not for the weak of stomach as the food, especially the choila and the potatoes, are very spicy. Of course, you could always wash away the heat with a cool, refreshing mug of the local chyang, a homemade rice beer that is excellent at Honacha.